We didn't set out to build a typical pickup truck. The world is filled with those already. Instead, we created a capable truck designed, developed and manufactured in America for Americans. 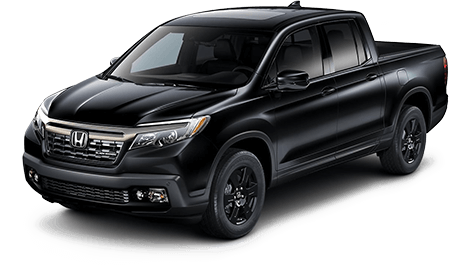 The 2019 Ridgeline is now available in 2WD or you can opt for the most advanced AWD systems in its class. It also has one of the largest payload capabilities in its class yet the Ridgeline seats five and has the roomiest, most flexible and quietest cabin of any midsize pickup truck on the road today. The stylish yet smart Ridgeline. It's the Honda of trucks. The National Highway Traffic Safety Administration gave the 2019 Ridgeline its highest possible 5 Star Overall Safety rating. Wherever you venture, the Ridgeline delivers a safe smooth ride and handling that's vastly superior to other pickups. And since it has a durable and spacious cargo bed, you can take your toys with you. 19 city/26 highway/22 combined mpg rating for 2WD models. 18 city/25 highway/21 combined mpg rating for AWD models. Based on 2018 EPA mileage ratings. Use for comparison purposes only. Your mileage will vary depending on how you drive and maintain your vehicle, driving conditions and other factors. The Bluetooth® word mark and logos are owned by the Bluetooth SIG, Inc., and any use of such marks by Honda Motor Co., Ltd., is under license. MSRP excluding tax, license, registration, $995.00 destination charge and options. Dealers set own prices. 280 hp @ 6000 rpm (SAE net). The USB Audio Interface is used for direct connection to and control of some current digital audio players and other USB devices that contain MP3, WMA or AAC music files. Some USB devices with security software and digital rights-protected files may not work. Please see your Honda dealer for details. HomeLink® is a registered trademark of Gentex Corporation. Apple CarPlay is a trademark of Apple Inc. Check the HondaLink® website for smartphone compatibility. Compatible with select phones with Bluetooth.® Your wireless carrier's rate plans apply. State or local laws may limit use of texting feature. Only use texting feature when conditions allow you to do so safely. SiriusXM services require a subscription after any trial period. If you decide to continue your SiriusXM service at the end of your trial subscription, the plan you choose will automatically renew and bill at then-current rates until you call SiriusXM at 1-866-635-2349 to cancel. See our Customer Agreement for complete terms at www.siriusxm.com. Fees and programming subject to change. XM satellite service is available only to those at least 18 years and older in the 48 contiguous United States and D.C. ©2016 SiriusXM Radio Inc. Sirius, XM and all related marks and logos are trademarks of SiriusXM Radio Inc.
 Pandora, the Pandora logo, and the Pandora trade dress are trademarks or registered trademarks of Pandora Media, Inc. Used with permission. Compatible with select smartphones. See: www.pandora.com/everywhere/mobile. Not all devices compatible with USB connection. Your wireless carrier's rate plans apply. The Honda Satellite-Linked Navigation System is standard on RTL-T models and above in the United States, Canada and Puerto Rico. (Honda HD Digital Traffic service only available in the United States, except Alaska.) Please see your Honda dealer for details. The system is not a substitute for your own visual assessment before changing lanes. BSI may not detect all objects behind or to the side of a vehicle and may not detect a given object; system accuracy will vary based on weather, size of object, and speed. Driver remains responsible for safely operating vehicle and avoiding collisions.